There are so many ways to “bake” a potato besides the traditional oven method! 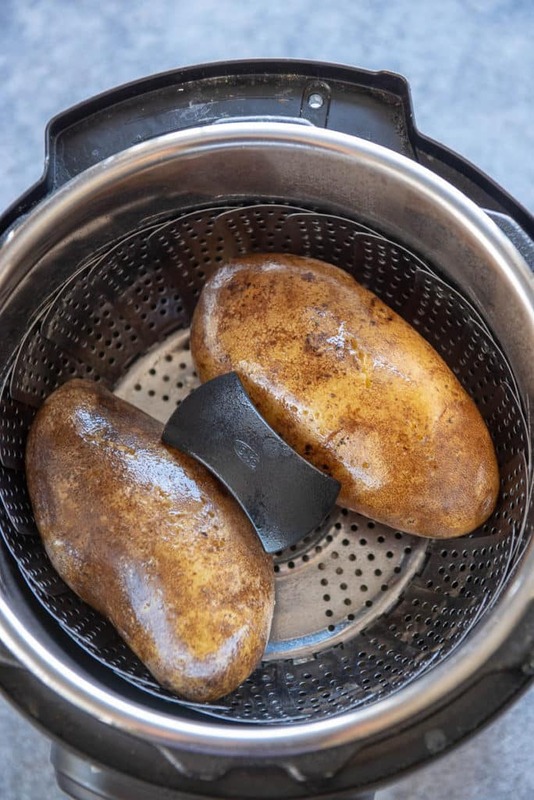 Today I’ll teach you how to make a baked potato in an Instant Pot! Want to make your baked potato on the grill? Check out this post! Is there any side dish more widely loved, more deserving of a spot on your dinner plate than a baked potato? I mean, who doesn’t love them? Are you going to turn it down if someone offers it? The problem is, we rarely make them ourselves, because, let’s be honest, while they may not be hard to make, they can be a little tricky. And making them in the oven? Who has time for that most nights of the week? Thank goodness for the rise in popularity of the electric pressure cooker! Now we can have fluffy, tasty, wonderful baked potatoes in no time! 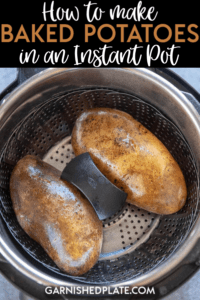 Today, I will share with you how to make baked potatoes in an Instant Pot! What kind of potatoes can I use for baked potatoes? You can really use any kind of potatoes to make baked potatoes and they all have their benefits and charms. But today we are going to go with a traditional russet potato. They have a higher starch content, less moisture and make delicious and fluffy baked potatoes. Russet potatoes tend to fall apart rather than keep their shape when good, which in my opinion, is perfect for a side dish. Easy to add butter and sour cream and break apart with your fork, they make a simple side dish that is perfect with just about anything. 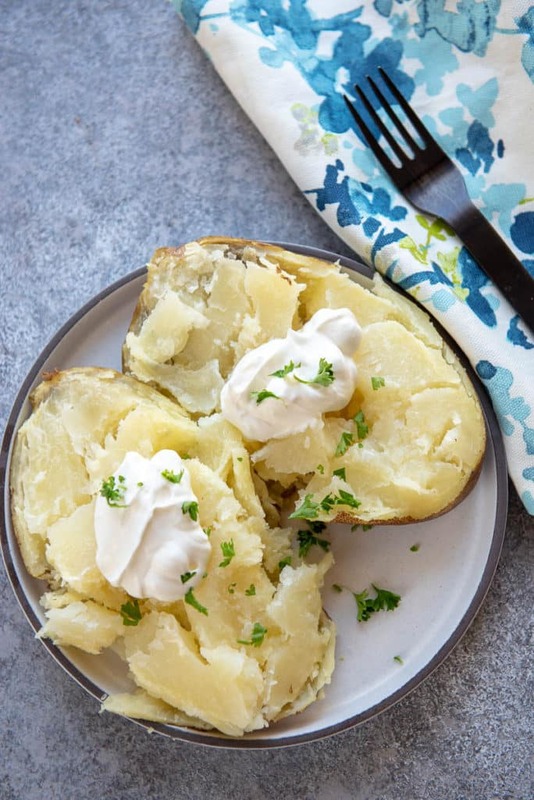 How do you make baked potatoes in the Instant Pot? By using pressure, the boiling temp of the water gets so high, that it can cook the food 4 times as fast. Want to learn more about this? This article explains much more that I ever could. The time needed, much like with oven cooking, will depend on the size of the potato as well as your preferred texture. I’ll continue this discussion below. 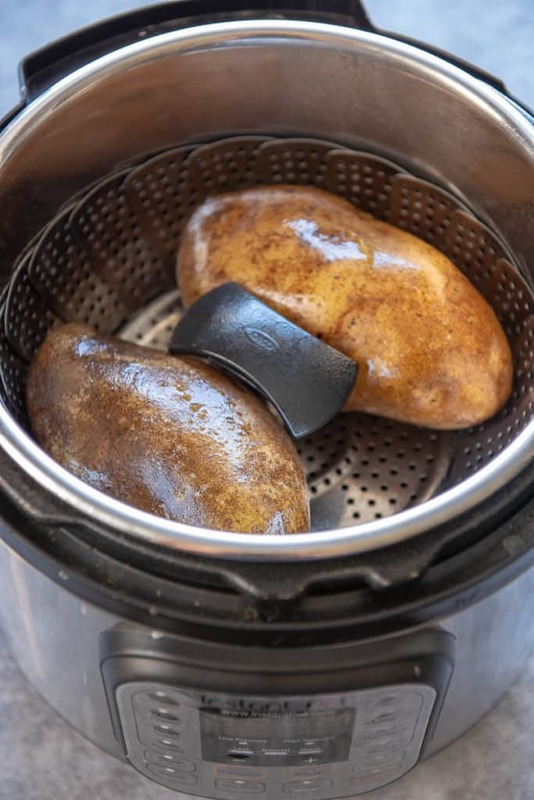 How long should I cook my potatoes in the Instant Pot? My potatoes were large – 14-16 oz each and I wanted them to be pretty tender so I went with a max time of 18 minutes. For a slightly firmer texture I would have gone with 16 minutes. Most potatoes area little smaller, more like 12 -14 oz so I would go with 14-16 minutes. And for a more average size potato like you might get in a 5 pound bag (this are usually more like 8-12 oz each) I would go with 12-14 minutes. Anything smaller of if you really prefer a firmer texture, I’d go with 10-12 minutes. 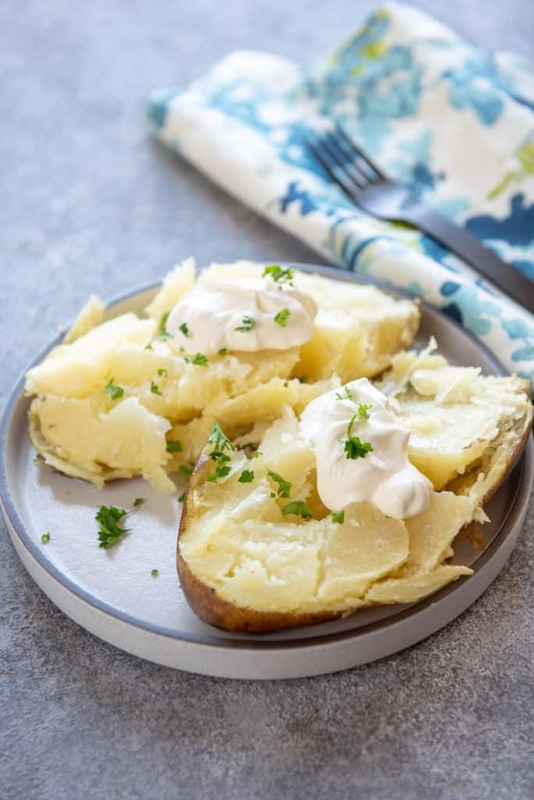 You might need to play around a bit the first time or two, but once you have the perfect timing down for the potatoes you use and the texture you like, you’ll be cranking out baked potatoes in your Instant Pot every week! There are so many ways to "bake" a potato besides the traditional oven method! 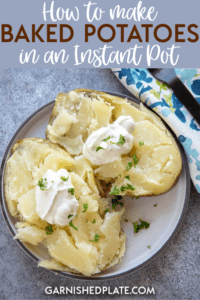 Today I'll teach you how to make a baked potato in an Instant Pot!